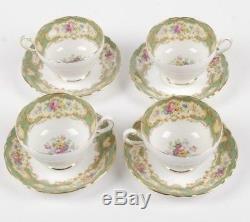 VINTAGE SET OF 4 PARAGON CHINA "POMPADOUR" TEACUP & SAUCER W/ 2 ADDT. A vintage set of 4 footed teacups and saucers by Paragon in the Pompadour pattern. The set includes 2 additional saucers. Hand painted florals, with gilding, and subtle scalloped edges. Each cup measures approximately 3 3/4" in diameter by 2 1/2" tall. Each saucer measures approximately 5 1/2 in diameter. Overall condition is very good. No cracks, chips, crazing to the glaze, or gilding loss were observed. Most likely these were just used for display. Three cups and saucers have the double Royal Appointment Paragon hallmark, circa early 1950's. The other cup and three saucers have the single Royal Appointment Paragon Hallmark, circa early 1960's. All saucers are additionally marked Pompadour. Don't forget to visit our store to see our complete selection of offerings from several categories including antiques, jewelry, handbags, and vintage clothing. _gsrx_vers_568 GS 6.7.3 (568). _gsrx_vers_837 GS 7.0.15 (837). The item "VINTAGE SET OF 4 PARAGON CHINA POMPADOUR TEACUP & SAUCER With 2 ADDT. SAUCERS" is in sale since Monday, September 29, 2014. This item is in the category "Pottery & Glass\Pottery & China\China & Dinnerware\Paragon". The seller is "whiteroomauction" and is located in Madison, New Jersey.